Brazil has been in the news in recent years, hosting worldwide sporting events such as the World Cup and the Summer Olympics. The global spotlight shone on a country that values tradition, pageantry, customs and diversity. The nation has made great economic and technological advances, and the rest of the world has taken notice. 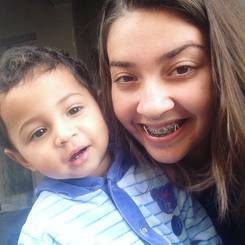 If you want to find an au pair from Brazil to live with you, EurAupair can assist you. We help families from the U.S. connect with au pairs from South America and other places around the world. 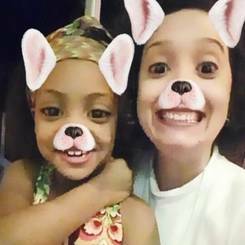 Read on to learn more about Brazil and why you should choose an au pair from this beautiful and vibrant country. When many people think of au pairs, they tend to think of Europeans. 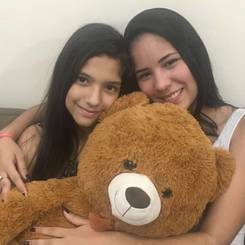 But we provide opportunities for young people from South America and other areas around the world to take care of children and study while living with an American family eager to get to know someone from a different country. Why choose Brazil? One reason is certainly the many differences between Brazilian culture and our own. Even our national pastimes of baseball and soccer stand in contrast to each other. You can also learn a lot about global politics. Children learn through play. 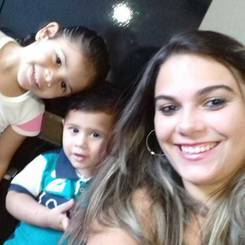 Your Brazilian au pair can teach your kids games and songs from their native country that will help build cultural bridges. Learning about another person’s beliefs and traditions is a wonderful way to nurture curiosity and develop empathy, traits successful adults share. The Brazilian culture is one of the world’s most varied and diverse. Being such a big country, there are cultural differences among various regions of the country. Brazil has many Portuguese influences resulting from the colonial time: most importantly its language, architecture, most of its customs, and catholic religion. Brazilians are considered rather affectionate, warm, and tactile people. Most Brazilians grow up with music and sports (predominantly soccer). Brazilians take pride in living a happy life and social norms do not consider punctuality as important as some other countries do. Clear communication is important so we recommend you to give clear guidance to your Brazilian au pair. Family is one of the most important values for Brazilians. Families are usually large, and extended family members are usually close with one another. They regularly meet for family gatherings and meals. Family members are there to support each other in times of need (if going through a hard time, or just helping with child care). It is very common for young people to live with their parents for a long time. As most universities do not provide dormitories, college students often live at home and commute, sometimes even after graduation too. Access to post-secondary education remains a challenge, especially for people from lower economic classes. High school students must pass entrance exams to access universities. Those who can afford to attend private schools for their secondary education tend to score higher in their exams; if they don't, they may choose to continue their studies in private universities. 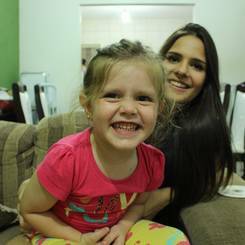 Most Brazilian au pairs will have gained child care experience through caring for their siblings, cousins, nephews & nieces, or neighbor’s children. 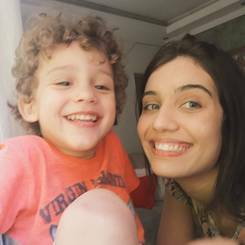 Growing up with children and having them around is a big part of their lives so you can expect to Brazilian au pair to quickly warm up to your child(ren). Obtaining a driver’s license can be difficult and is quite costly in Brazil; it costs more than a monthly minimum wage. In addition there are long wait times for driving lessons and exams. We encourage you to discuss your driving needs with au pairs during the interview process. Learning English in schools is more and more common, although not mandatory in Brazil. Some of those interested in learning the language often attend private schools or take private classes and therefore English fluency can vary from one economic class to another. Now that you know more about Brazil and its residents, we invite you to browse through our profiles below to see the au pairs we have available. You can see their child care experience, interests and comments, which can help you find the right au pair for your family. You may apply right away to host. I babysat Maria (1) from March 2010 to April 2016. I fed and bathed her and supervised her activities. I worked at a cultural center with children ages 5 to 18 years old telling them about history and art. I worked as a teacher's assistant taking care of children ages 6 to 10 years old. I helped the teacher to take care of English students during the test days and with field activities. Finally, I also supervise and help children from 3 to 9 years old in Ballet class. Per a reference: "Hellen is a great girl and is very excited about being an au pair. She is very responsible and daring and will be a great help for some lucky family. She is very into arts and history. Kids have a lot of fun with her, she is very creative and has a lot of energy to play with them, and she is also good to put limits when it's needed." I was a scout leader from January 2015 to December 2017 to a group of children ages 7 to 10 years old. I prepared and assisted with outdoor activities and gave the children snacks. From March to November 2017 I volunteered at a school taking care of children ages 3 months to 8 years old. I supervised the children, played with them, monitored lunch time and assisted with homework. I babysat Igor (10) and Laura (2) from January 2014 to December 2017 occasionally. I supervised and played with the children, fed and put them to bed. 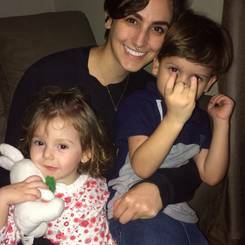 I babysat Davi (5) and Gabriel (3) from January to December 2016. I helped with homework, prepared meals and snacks and put the children to bed. I consider myself qualified because I am a very responsible person, calm, charismatic, communicative and I always try to please everyone. I'm very calm with the kids, I like happy things and I always try to please them in the best way, besides loving to help them in their activities, it is so gratifying to be able to see their growth. My strengths are persistence, communication, charisma. In 2017 I was responsible for Vinicius (8) I picked him up from school, helped him with homework and played with him. In 2018 I have been taking care of Joao (3) I prepared meals for him, helped him with showering and put him down to nap. In 2018 I have been taking care of Miguel (6 months) I prepared food for him, bathed him and put him down to nap. I want to be au pair because I've always liked to be with kids, I feel they like me and they trust me. I consider myself qualified to be an au pair because I am a very responsible person and also very patient and helpful to deal with children. I have lived with kids around me for a long time, so people say that all the kids love me. The main strengths that I have is to be always honest and responsible with everything that I do, and always attentive and sensitive with the kids that I care. I babysat Maria (4mths) from May to July 2012 fro 45 hours per week. This included changing her diapers, preparing her bottle, making her lunch, bathing her, taking her for a walk, playing with her, and putting her to sleep. I also babysat Davi (5) from January to March 2016 for 13 hours a day, 3 days a week. This included feeding him dinner, playing with him, helping with homework, giving him a shower, and putting him to sleep. From December 2017 to February 2018, I babysat Alice (1) for 10 hours a week. I would change her diaper, give her a bottle, give her lunch, bathe her, play with her, and watch television with her. Finally, I lead bible study to a group of children 3 to 14 years old from February 2010 to May 2017. I did this for 2 hours a week where I would read the bible to them, explain it to them, give them activities, teach them the correct answers, and show them movies. Theater, going to the movies, going to dance with my friends, and playing soccer and volleyball. 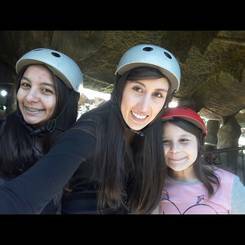 I want to participate in the au pair program because I see it as an opportunity to learn and contribute knowledge to another family. I see it as an opportunity to improve my English, have direct contact with another culture, take courses that can improve my professional curriculum, meet new people, and explore new places. The family that will host me will not regret it because I am very committed, responsible, patient, and creative. Due to my theater classes, I know a lot of games that can distract children for hours. I watched Olga (6mths) from February 2017 to March 2018, six days a week. This included playing with her, giving her food, bathing her, dressing her, and telling stories to her. I taught at a soccer school from January 2017 to July 2018, three days a week where I developed activities and taught kids ages 4 to 16 how to play soccer. Lastly, during school vacations from June to December 2017, I babysat Gabi (6). I played with her, painted and drew with her, and prepared meals for her. Cooking, going to new places, going to the dance club, going to the movie theater, going to a show, going out to eat, playing soccer and basketball, skateboarding, running, and walking. I want to become an au pair because it is the best way to know more about American culture and the program will bring me many new experiences, both personal and professional. I love learning new things and this program will teach me a lot. I consider myself qualified for this program because I have experience with children and I love being apart of their lives because it is a very unique feeling. I babysat Raul (4) from February to November 2016 for 2 days a week. I would make his bed for him, keep and eye on him during meals and rest periods, help him with homework, prepare snacks for him, feed him, bathe him, and play with him. From January to December 2017, I watched Daniel (3) 5 days a week. My duties included making his bed, supervising him, making him snacks, feeding him, bathing him, and playing with him. Lastly, Since June 2016 I have watched newborn Alicia daily. I feed and bathe her, change her diapers, prepare her bottle, watch her during her naps, play with her, and drive her. Spending time with my siblings, listening to music, reading books, watching videos and series, working, and watching movies. 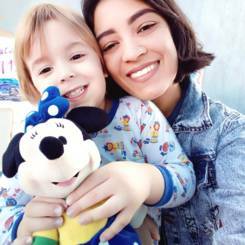 I want to become an au pair because of my fascination and experiences with children and also because I really want to get to know your country and culture. I think that I am qualified for this program because I have always liked to work with children and I also did really well with them; just like the saying "if you do what you love, you'll never work a day in your life." Even though I'm not working in child care at the moment, I have a 2 year old sister and I take care of her whenever I can. I feel that my primary strengths are being patient, careful, attentive, and focused. 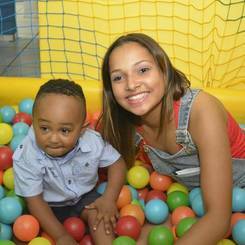 ***Vivian would like to care for children older than 1 year*** I babysat Caua (5mths) from May to December 2015 for 8 hours a day, 6 days a week. This included waking him up, bathing him, changing him, feeding him, playing with him, and putting him to sleep. From April 2016 to March 2017, I watched Caua (9) and Cayque (11) for 6 hours a day, 6 days a week. My responsibilities included waking them up, making them breakfast, making sure they showered, taking them to school, picking them up from school, giving them lunch, and taking care of them at home. Finally, from June 2017 to July 2018, I babysat Miguel (4) for 8 hours a day, 6 days a week. I would wake him up, give him breakfast, get him in the shower, take him to and from school, and give him lunch. Watching movies, listening to music, traveling, going out with my family, dancing, and martial arts. I love to work with children; I identify with them and understand them well. They make me happy with their joy and innocence, always playful and smiling. I like to be helpful with children and minimize the daily stress for the parents and make sure that everyone is happy. I previously was a volunteer teacher at an orphanage where I taught various recreational sports, dancing, and martial arts skills. I have a dream of completing this program for better professional and personal growth and also as a great opportunity to meet new people, new cultures, new environments, and a new language. I watched children ages 6 to 15 form February to July 2018, 3 times a week. I helped the social educators in physical and recreational activities with the children, as well as played and interacted with them. From January to May 2012, I supervised a group of children, ages 1 to 15, as well as kept them entertained, for 5 days a week. Lastly, I watched newborns to children 6 years of age from February to July 2018 for 5 days a week. This included helping them bathe, giving them food, doing various work out activities, and playing games with them. Collecting action figures, watching medieval movies, going to geeks & anime fairs, watching TV series or movies, skateboarding, roller skating, and watching soccer. I decided that I want to become an au pair because I really love children and I think we can always learn from them. I want to give all my love and affection to the children and I want to be part of their education and growth. I believe that I will be an excellent au pair because I consider myself a calm, positive, and responsible person. I do everything to live well with other people, respecting them, and being flexible with differences. I have a great desire to learn new things, and hope to be very useful to my dear host family. I babysat Helena (1) five days a week from August 2017 to June 2018. I did everything from meal preparation to baths, changing diapers, and playing games. I also babysat Arnold (6) from February 2016 to June 2017 for five days a week. With him, I also prepared meals, gave baths, got him ready for school, and played games. Reading fantasy books, going for walks, listening to music, being in touch with nature, handball, and football. Being an au pair is the best chance for me to meet a new family with a whole different culture. It'll be great for me to improve my English, too. I've always had this need to help people (that's the main reason why I want to be a flight attendant) and to feel useful. So, since I love caring for children, it's an amazing opportunity. I am fun, creative, patient, responsible, and able to act really fast to solve a problem. My flight attendant course gave me a lot of knowledge. Because of it I am first aid certified and beyond that, I learned fire fighting measures and emergency procedures which can be used in common situations of everyday.